Even if you do bring essential dorm room organizers and space saving college furniture to your dorm, you might still have some college essentials that need a home. And if you have a raised or lofted Twin XL bed, the space underneath is the perfect place to store your dorm essentials that have nowhere else to go! While this is a great space saving solution, the sight of all of that underbed storage might make your dorm room still seem messy and unorganized. This is why adding a dorm bed skirt to your extra long Twin sized bed is the ultimate solution when it comes to college decor! Our Ombre Nights Bed Skirt Panel with Ties - Faded Black comes in panels, so you can get the perfect amount of coverage for your dorm room. With dimensions of 45"W x 60"H, these white and faded black bed skirt panels are the perfect size for a raised or lofted dorm bed. Simply attach each bed skirt panel to your Twin XL bed and you will immediately see the difference they will add to your dorm decor. Not only will these stylish faded black bed skirt panels hide your unsightly underbed storage, they also have a fashionable design to add to the overall look of your dorm room. The popular ombre style is everywhere, so why not add it to your Twin XL bedding? 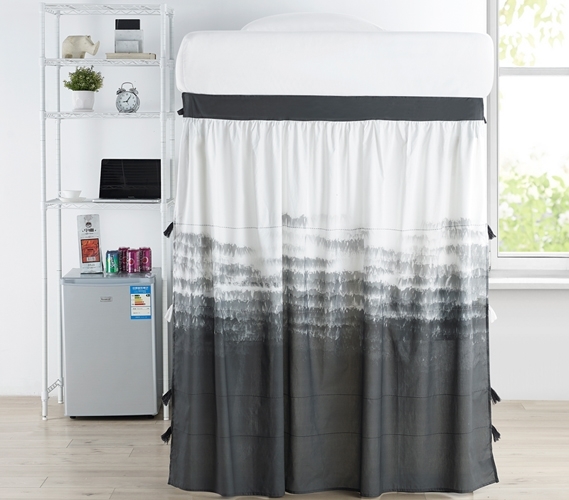 These faded black and white extra long Twin bed skirt panels feature this ombre pattern to upgrade the appearance of your college decor.